We had a busy weekend so we have a long post with lots of pictures. The fun never ends for us on the road. Friday morning after driving almost 200 miles exactly from our overnight spot at Flying J in Sullivan, Kelly Jo heard the shroud from our front roof air conditioner unit fly off. I have seen a shroud hit the ground in a million pieces in times past but I missed this one. I did not hear it come off because I was listening to Christmas music and was caught up in the moment as I had been for hours. I looked later to see which song had my attention. It was "Let It Snow, Let It Snow, Let It Snow." That is funny because I absolutely love the song and absolutely hate snow! As soon as Kelly Jo alerted me, I turned on my blinker and headed for the exit that was less than 1/2 mile ahead. I could see several cars behind me in both lanes so I fully expected at least one of the cars to follow me because of plastic pieces raining down on their cars and trucks. Sure enough, one truck also took the ramp. I turned right to go to a parking lot but he turned left. I guess not. Whew! That was close! The exit I was taking "just happened" to be the exit for an RV parts place we have stopped at literally dozens of times in the last 13 plus years. I have purchased parts there for every trailer we have had and every truck we have had and the bus in that time span. We have bought everything from fifth wheel hitches to windows to sewer valves to drawer catches in there and about 100 more things. I pulled in the parking lot and confirmed the shroud was missing. I had Kelly Jo get online and check what I paid for the last one from Amazon and also how quick I could get one as I am moving every day next week. She was also checking the weather in various places we will be. If the local price was high, the forecast was rain free and the shipping quick, I would order online. If rain was in the forecast before I could get one shipped, then I would buy one inside no matter what the price. I like having a plan. I walked in and the guy said, "You look like you need a cover for a low profile dometic air conditioner." I said, "Yes, how much?" The lady next to him said, "$80." I said, "I will take six of them at that price." Two minutes later I was walking out the door with it. No sense looking online. It is amazing that the shroud turned lose less than 1/2 mile from their exit. Since I often grumble when I am a day late and a dollar short, I think I need to be thankful for times like this. Providence anyone? We stopped 100 miles later right next to the interstate and parked at the Quick Trip in Claremore to meet the Millikin family for a quick lunch. Bro. Jimmy "just happened" to have his six foot ladder in the car with him so I used it to scramble up through the escape hatch and put it on. As you can see, the shroud was completely gone. One screw was missing. Three of the four screws were intact. Bro. Jimmy un-boxed it for me and handed it up. Since I have done this song and dance routine a few times, we were ready to go to lunch in a few minutes. We had a nice visit with our dear friends and a very good meal. Thanks for taking time to meet us, friends, and thank you for the lunch. We hope to see you soon down the road some place! We pulled into Bethany Holiness Church between 2:30 and 3:00 and Bro. James Burgess helped us get parked and hooked up. He also helped us carry in sound equipment. By the time we set the sound and cleaned up it was church time at Bethany! We had a great Planning and Vision Service at Bethany and other on Saturday night at Blanchard. We are anticipating a great service tonight near Ft. Worth. I will try to post pictures and information about those services tomorrow. Saturday morning we moseyed toward Blanchard, going through a very busy Oklahoma City. We only made one stop and it was for a late lunch at Golden Corral in Norman. We actually made it to Blanchard in time to get some rest but I was too pumped up to take a nap. Sunday morning we sang and preached in the outreach service at Blanchard. We love being a part of this service and Sunday morning seemed especially good. I sure appreciate Bro. Birdsong and his folks allowing us to be in the service. We had a little fun at the restaurant Sunday afternoon! 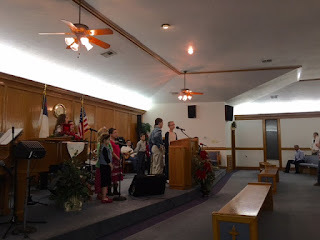 Sunday night we had another wonderful service at Blanchard. God helped us all in the service and it was great to be there with our friends. I wonder if a certain reader in Ohio recognizes any of these youngins? That pretty much sums up a super great weekend! Hey no fair! You got to hold my grand babies! I can't wait to see them myself in a couple of weeks. I heard your weekend services were great. They have some of the cutest kids at that church! Their moms don't look too bad either. I heard you had some good services.